I’ve never been very good at keeping records of quick projects so I’m hoping that having this blog gets me into the habit. He’d asked for red. 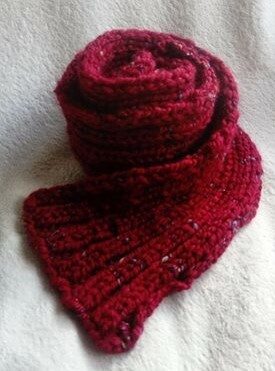 I wanted a strong colour but not pillarbox so selected King Cole Super Chunky Twist in Claret Twist. The flecks of other colours gives it a bit more interest without taking away the depth of red. The yarn is 100% acrylic but incredibly soft and really easy to work with. I used 9 mm needles and worked knit 2, purl 2 over 22 stitches. Not quite sure exactly how long it took to finish as I worked on it on and off for an evening, I would think around 2 hours. Using 2 balls resulted in a generous scarf measuring about 18 cm/7 inches wide and 112 cm/44 inches long.